Fewer children are getting vaccinated, even as concerns mount nationally over the resurgence of infectious diseases such as pertussis, measles and chickenpox. Maine’s rate of parents opting their children out of school-required vaccines reached an all-time high this year, according to the Maine Center for Disease Control and Prevention, alarming public health experts and making the state vulnerable to the return of preventable infectious diseases such as measles, pertussis and chickenpox. The non-medical opt-out rate for students entering kindergarten climbed from 5 percent in the 2017-18 school year to 5.6 percent in 2018-19, according to the Maine CDC. Medical exemptions doubled, from 0.3 to 0.6 percent. Maine’s opt-out rate is more than three times the national opt-out rate of 1.8 percent for kindergartners in 2017-18, the most recent national data available. Of the 12,875 kindergartners who enrolled in Maine schools last September, 798 were not vaccinated against measles, mumps and rubella; 528 were not vaccinated against chickenpox; and 708 were not vaccinated against diphtheria, tetanus and pertussis, the CDC data showed. 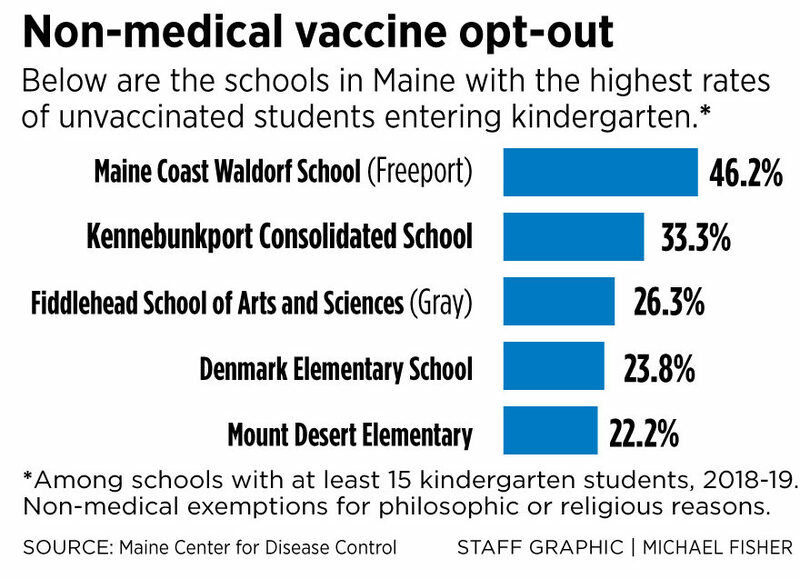 Some individual schools had startling rates of non-medical opt-outs for kindergarten students, including unvaccinated rates of 46.2 percent of kindergartners at the Maine Coast Waldorf School in Freeport and 33.3 percent at Kennebunkport Consolidated School. Debi Skolas’ 16-year-old daughter,Alannah Shevenell, is immune compromised because she had a six-organ transplant several years ago while battling cancer. Skolas, of Hollis, said it’s “unfair” that she has to be afraid to send her daughter to school every day, knowing that a preventable infectious disease could send Alannah to the hospital. Alannah, who is now cancer-free, recently spent a night at Maine Medical Center with pertussis. Maine lawmakers are currently considering a bill that would ban non-medical exemptions for the vaccines required to attend school. Currently, parents can forgo immunizations for their children on philosophic or religious grounds. A March 13 public hearing about the bill, sponsored by Rep. Ryan Tipping, D-Orono, and Sen. Linda Sanborn, D-Gorham, attracted hundreds. The education committee will discuss and possibly vote on the bill Wednesday at the state capital complex. Meanwhile, Maine’s pertussis rate is the worst in the nation – with 446 cases in 2018 and 136 through the first three months of 2019. Also, some state residents were recently exposed to measles when an infected person from Massachusetts visited Falmouth. Washington state and New York City are currently experiencing measles outbreaks. The U.S. has had 387 measles cases in 15 states in 2019, the U.S. CDC said. “The kindergarten exemption rates are now at an all-time high of 6.2 percent,” according to the Maine CDC. Also, the kindergarten vaccination rate for the measles, mumps and rubella vaccine (MMR) declined from 94.3 percent in 2017-18 to 93.8 percent in the current school year. “This continued downward trend in immunizations means Maine is below the ‘herd’ immunity level of 95 percent immunization for all vaccine requirements except varicella (chickenpox). Herd immunity occurs when a high percentage of a community is immune to a disease through vaccination and/or prior illness, making the spread of disease from person to person unlikely, even among unvaccinated individuals. Currently, 172 of 341 total kindergarten classes fall below this 95 percent threshold,” the Maine CDC said in a statement. Dr. Laura Blaisdell, a Yarmouth pediatrician and vaccination advocate, said the opt-out rates are an alarming trend, and Tipping’s bill is needed to protect Maine residents. “It’s not enough now to simply educate and request people vaccinate their children,” Blaisdell said. Blaisdell said Maine has gotten lucky so far by avoiding a measles outbreak. The last measles case in Maine was one case in 2017. Myths about vaccines – such as the debunked theory that there’s a link to autism – persist despite overwhelming scientific evidence that vaccines are safe and effective at preventing disease. Tipping said the pending bill would help protect against measles and other infectious diseases, and he’s so far been encouraged by parents who have contacted him to tell him the bill is needed. “The goal is to make our schools and day cares a safe place to go and learn and grow,” Tipping said.